Characteristic of the contemporaneous age, and taking advantage of the diffusion of digital technologies, virtual communities are diffusing in the organization’s culture such as places where members can learn, work, or simply meet. The evolution of the same digital technologies, and the development of Digital Virtual Worlds in 3D (such as Second Life), permits now to think of new tools for the organizational communities and for communities in general that could build new knowledge, share common practices, and work together in immersive and collaborative spaces. Digital virtual spaces can contribute to change the traditional structure and definition of virtual communities, and can also contribute to their digital development, in the field of participation. According to Castells (1999), the contemporaneous age can be called ‘Information Age’: main processes and functions are growing organized in Nets. These Nets put in order a new social morphology, and the diffusion of Net logic modifies productive, cultural and social processes, and also experience processes. Therefore, Net is a system of interconnected elements that can also connect to other elements, creating other Nets and creating “new orders in the world and in heads” (Eco, 2004, p. 162). The new paradigm of Information Age consist in the capacity of information and communication technology in diffusing the Net into the social structure. The power of information and communication flows is more important and stronger than political power: to be or not to be present in the Net and in relation with other nets is a crucial element to dominate and transform society. In this framework, virtual communities play an important role, because communities live in Nets and constitute Nets: the same constitution of the Net passes trough people that are in it, building relations with other people, building infinite Nets. Moreover, according to Veen e Vrakking (2006), a new generation is emerging in the contemporaneous age: the Digital Natives. This generation lives absorbed by digital/virtual tools and environments, using them daily to connect with people, especially building communities. According to Levy (1999) and Palloff and Pratt (1999), virtual communities are defined as electronic Nets of interactive communication, constituted by sharing interests, knowledge, common projects and tools to realize it, established in a cooperation process. Communities can also be characterized by identity processes (Turkle, 1999; Wenger, 2006): members of communities experiment ‘sense of membership’ because of sharing common contents. Members are involved, moreover, by social relations and interactions: because of this, Levy (1999) and Castells (1999) state that the importance of Digital Technologies is in offering the possibility of creating and implementing communities. In developing communities, emotions play an important role: members of communities express themselves online trough different tools, not only writing; voice, ‘smiles’ and graphic/video expressions contribute to communicate different feelings. 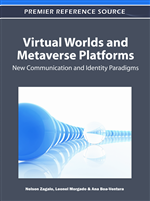 Therefore, different digital technologies offer the possibility of members sharing emotional ties; in the case of Metaverse technology, this possibility is developed by textual language, voice, graphics and sign language. It means that the members’ personality can be expressed by his way of writing, his opinions in a discussions, the customization of his own avatar and so on; Virtual Learning Communities of Practice are surely involved in this process, and are based on maintaining relations and developing new interactions.